Turkey Breast - 8-12 pounds, boned if preferred, though a bone-in turkey breast is even tastier! Rinse the turkey thoroughly. 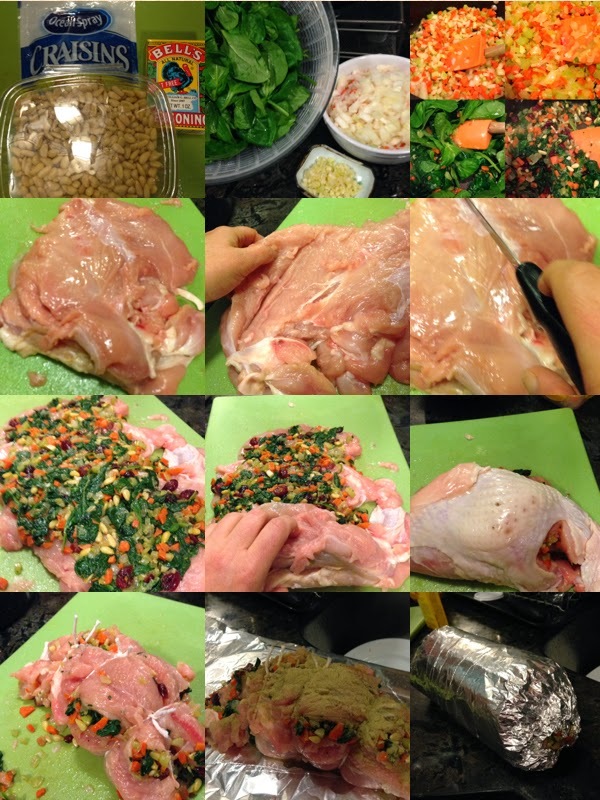 If using a whole turkey, remove the giblets, nick and all excess skin/fat. Remove any pin feathers, blood and vessels, liver and gizzards from the inside of the turkey cavity. Remove the plastic thermometer if one has been inserted by the poultry manufacturer & throw it away! Place the cleaned & rinsed turkey in a stock pot or large CLEAN container. Add in the Kosher Salt, 1/2 Gallon of Apple Cider and cover the turkey with cold water to cover it completely. Stir the water to dissolve the kosher salt. Cover or close the container and refrigerate the turkey minimum 8 hours to 24 hours. If your refrigerator is not big enough to hold turkey & brining solution, use a cooler. Place the brined turkey in its salt-cider-solution container/pot/brining bag into a large cooler. Surround the container/pot/bag with ice - enough to completely surround the turkey. Close. Use a thermometer to check the ambient temperature of the cooler. It should be under 40 degrees, ideally in the 32-38 degree temperature zone. After the turkey has brined between 8-24 hours, remove from brining solution. Discard the solution. Rinse turkey and allow to drain for 15-30 minutes on rack over a sheet tray. If not roasting the turkey within 30 minutes, cover & refrigerate until ready to cook. It is not necessary to add any additional salt to the turkey once it’s been brined. Your turkey will be salted and seasoned perfectly thought each bite. For best results, brine the turkey a day ahead of the Thanksgiving Meal. You can brine it two days ahead. Brine it for 8 to 24 hours, then rinse and drain it. Put the brined turkey into container and back into the refrigerator. When ready to stuff and roast, take the turkey out of the refrigerator 30 minutes before ready to use. Brining will work for a whole turkey, a turkey that is broken down into its parts (Wings; Breast; Thighs; Legs; Back), or just the turkey breast - bone-in or boneless. NEVER BRINE A KOSHER Turkey - it’s already been salted. When stuffing or filling the cavity or meat of a brined turkey, don’t add too much salt to the mixture, as the salt in the brined turkey will have more than enough it it already! Prepared Brined Turkey as per recipe. Prepare vegetable stuffing - dice the carrots, celery and onions and mince the garlic. Heat 2 tablespoons olive oil over medium-high heat until the oil shimmers. Sauté the aromatic vegetables until the onions and celery turn translucent and the carrots begin to soften - about 5 minutes. Add in the garlic and sauté another 1 minute. Add in the poultry seasoning, stir to incorporate. Add in the spinach leaves, sautéing them until they wilt. Remove the mixture from heat and stir in the chopped parsley, the craisin and pine nuts. Season to taste with freshly ground black pepper and a smidgen of salt. Set aside and allow the mixture to cool while you prepare the turkey breast. Bone and filet open the turkey breast - opening it like a book. Cut down the center of the turkey breast, from the inside and then cut a slit into each side of the breast, not cutting all the way through the breast. Open the turkey as though you were opening the pages of a book, making a center incision and folding/peeling back the turkey breast layers. Season the turkey breast with freshly ground black pepper, then spread the cooled sautéed vegetable mixture into the center of the filleted turkey breast. Close or roll up the turkey breast. If using kitchen string, tie together and truss into a neat and somewhat even roast. Rub the turkey breast with remaining tablespoon of olive oil to coat it and season with addition ground black pepper and if desired, Bells Salt-Free Poultry Seasoning. 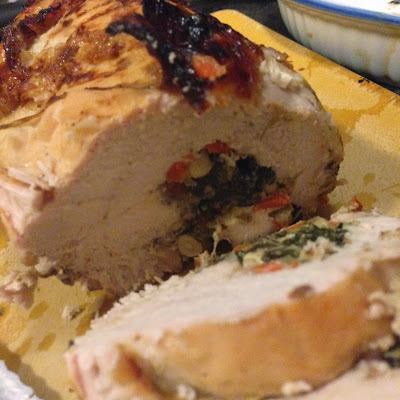 Place the stuffed & trussed turkey breast in a roasting pan. Roast the turkey at 425 degrees for 1 1/2 hours. If the turkey has been trussed, check the pan and add in apple cider and/or water if the pan dries out, a 1/2 cup at a time. If the turkey is in aluminum foil, remove the foil the last 1/2 hour so the at the turkey can brown. Check the temperature of the turkey to check for doneness. A throughly cooked turkey breast should register 165 degrees on an instant read thermometer. The juices will run clear, there will be no traces of pink in the center and the meat will be be completely white/opaque throughout. Allow roasted turkey to rest, loosely covered for about 20 minutes before slicing. The accumulated pan juices can and should be used to make your gravy. The cider brined turkey will release juices that have a sweet and salty flavor making the pan drippings savory and flavorful. Skim away any fat that has accumulated in the pan. If the pan juices are too watery, reduce them on the stovetop until the liquid has reduced by half. If the pan juices are too dry, add in addition water, chicken or turkey stock to reconstitute the dried bits from the bottom of the pan. The pan juices will not need any additional salt or pepper - it may be already seasoned perfectly from the turkey. Set the roasting pan with turkey drippings over two burners set on medium-high heat. If using wine or vermouth, add in along with 1/2 cup of stock; cook, stirring with a spoon to loosen up the browned bits in the pan and allow the liquid to come to a simmer - about 5 minutes. Add in the remaining stock & apple cider (if using) and parsley and bring the mixture to a boil over medium-high heat; reduce the heat and let simmer for about 5 minutes. Make a slurry with the flour and about 3 tablespoons of cold water. Mix well to incorporate the flour into the water. Gradually whisk in the flour slurry into the roasting pan. Bring the mixture to a boil over medium-high heat, the reduce to low and gently simmer to thicken the gravy and cook out the raw flour taste - about 10 minutes total. Taste and adjust seasonings as needed. Keep hot and serve hot. Make a slurry and you’ll have no lumps in your gravy! Denine - this looks AMAZING! Do you have a video of you making this. I'm perplexed and intimidated by filleting the breast. I have a wonderful 6 lb. breast I bought the other day at my co-op, to make this weekend. (expensive little all-natural, never frozen mammary!) Would love to simply watch you (or someone) filleting the breast in this manner. The pics above confuse me. Great recipe though - can't wait to try this brining method! !